The Wyoming Geographic Information Science Center (WyGISC) is developing a new program in ecoinformatics in support of the campus-wide Program in Ecology. A component of a larger University of Wyoming ecology initiative funded by the National Science Foundation Experimental Program to Stimulate Competitive Research. The program specific goals are to foster integrative work in informatics and geographic information science, which will support ecological research tied to ecological topology and ecosystem response to global change. Research responsibilities include: 1) improve access to ecological data, information and computational services through data acquisition, data integration, and management activities; 2) develop and implement spatiotemporal data analysis and modeling techniques; and 3) participate in the development of collaborative initiatives and programs between WyGISC and the UW Program in Ecology. Ecoinformatics, (sometimes referred to as eco-informatics or ecological informatics) is the management and analysis of ecological information and the facilitation of large-scale ecological research through the application of computer technology. 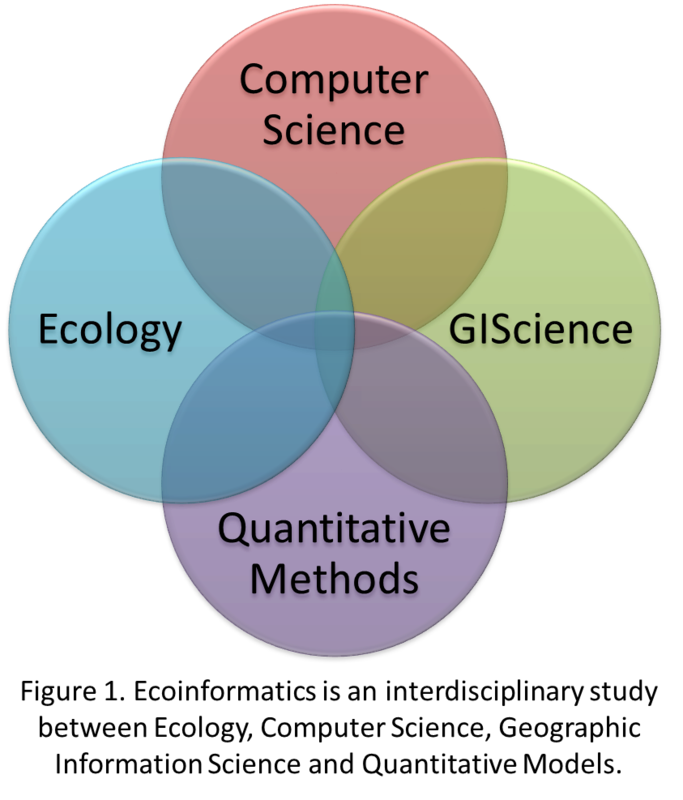 Ecoinformatics is an interdisciplinary study between Ecology, Computer Sciences, Geographic Information Sciences, and Quantitative Methods (Figure 1). Recknagel (2006) described Ecoinformatics, in an editorial, as the interdisciplinary study and understanding of information processing from genomes to ecosystems, meta-information concepts for ecological data management, computational ordination, clustering and forecasting of complex ecological interactions, and facilitating informed decision making for sustainable ecosystem management. Ecoinformatics promotes novel exploitation and integration of ecological data and knowledge by means of state-of-the-art computer technology. It promotes object-oriented approaches for ecological data and model libraries, remote sensing and GIS for ecological data acquisition and visualization, bio-inspired software and hardware solutions for advanced quantitative ecology and computer design, as well as semantic webs for sharing ecological information and models.